1) It's native to Tennessee and throughout much of the Southeast and Midwest. 2) Missouri Botanical Garden says it can tolerate both heat and humidity. 3) Cornell says it grows well poorly-drained clay soils. 4) According to University of Florida, it serves as a host plant for cloudless sulphur butterflies. 5) Per the Georgia chapter of the North American Butterfly Association, wild senna also serves as a host plant for sleepy orange butterflies. 6) The Midwestern Native Garden says that Senna marilandica flowers attract bees and some butterflies, while secondary nectaries attract ants and lady bugs that protect the plants from predators. The book also indicates that wild senna serves as a host plant for other butterfly species including little yellow, silver-spotted skipper and gray hairstreak butterflies. 7) The Illinois Natural History Survey says the flowers can also attract hummingbirds, while stands of wild senna provide excellent nesting cover to wildlife. 8) The U.S. Fish and Wildlife Service says that wild senna seedpods are an important source of food for upland gamebirds. 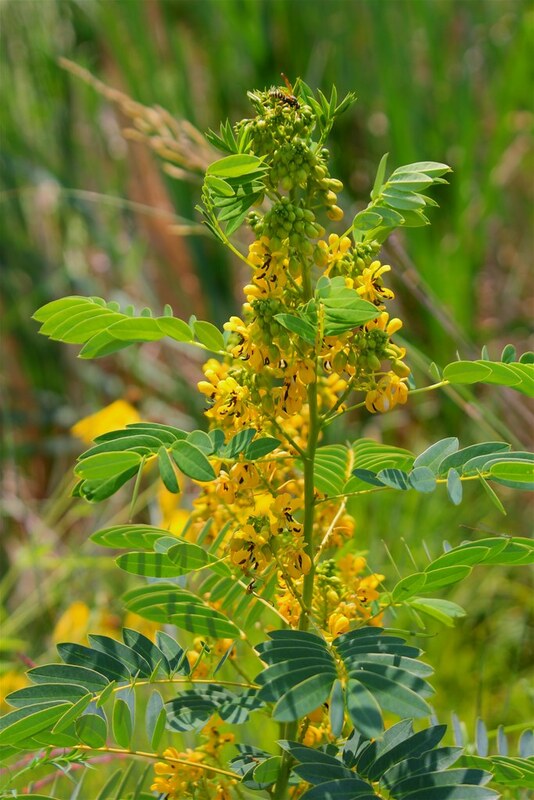 Do you grow wild senna? If so, what has been your experience with this plant? I've seen this plant in some gardens. Unusual and attractive. Is it a perennial? Very cool. I've never grown this one, only seen it in native seed catalogs. Well, I haven't seen the seedlings sprout yet, but I hope to grow it in my garden this year and hopefully it will look as beautiful as it does in this photo!